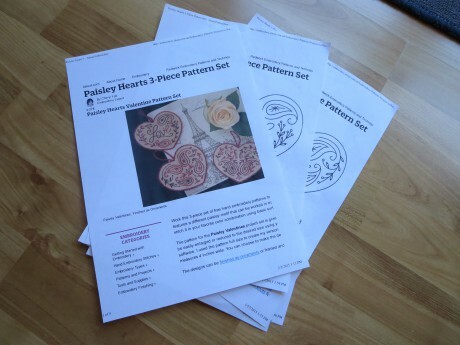 Last month I blogged about displaying work in hoops. Today I want to share another project displayed this way. I love working with wool felt and Aurifil Cotton Mako Ne 12 (on the red spool). 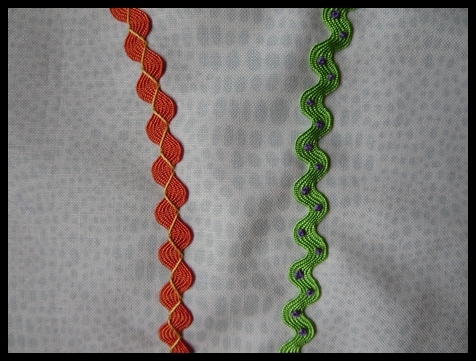 I love the colours available and the ease of sewing. The cotton just glides through the fabric. Aurifil Lana (Australian wool and acrylic mix, also 12 weight and on a red spool) is also ideal for this work. 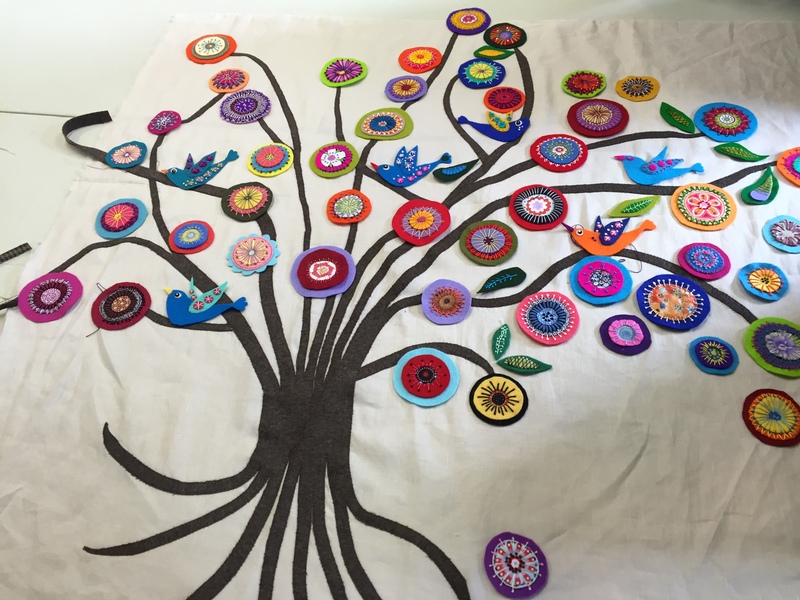 I decided to make a hanging using my collection of wool felt in bright cheerful colours and a selection of co-ordinating Aurifil Cotton Ne 12 threads. I gathered some resources for inspiration and technical know-how and started designing my project. I especially found the work of Wendy Williams (http://www.flyingfishkits.com.au) and Sue Spargo (http://www.suespargo.com) helpful. I drafted my design on paper to give me an idea of placement and proportion, though as you might notice, I later changed some of the embellishment details. A rough draft which I later altered. I like the addition of rick rack in my projects and so I incorporated this here. Using rick rack for the stems. Next came the first flowers. 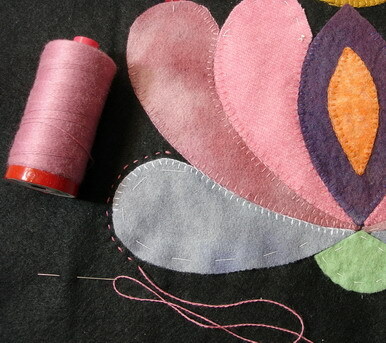 Arranging the flower components and selecting the thread colour. Two different leaves and a stem. 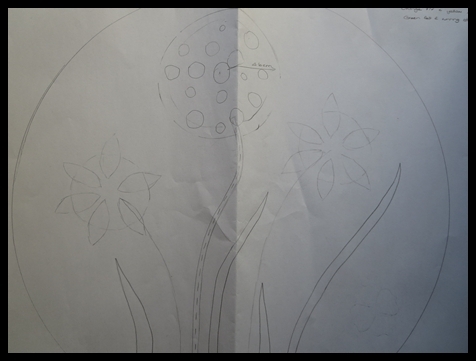 I created a large flower. 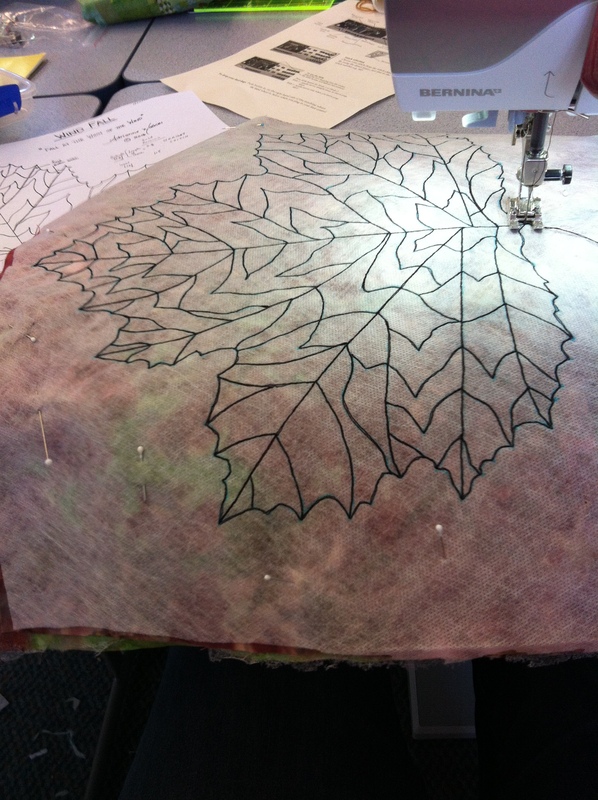 Adding embroidery to the large flower. 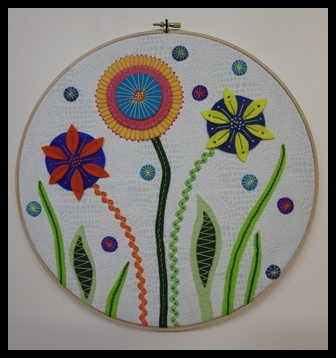 When I had completed all my stitching I needed to place my work into its hoop and back it. Securing my work in the hoop. 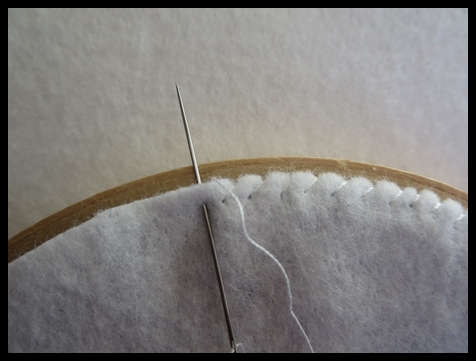 Stitching on the felt backing. This was such a delightful little project to make, I’ll definitely be making more items like this! It is always a special treat when a customer brings a project that they have stitched with Aurifil into the store for “show and tell”. This delightful scarf has been designed by Jan at Windflower Embroidery. 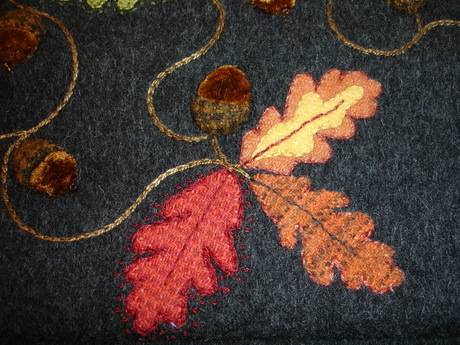 It is just perfect for those wintery days that we are experiencing, a lovely soft angora wool background trimmed with wool applique autumn leaves embellished with Lana wool thread. Just the description is enough to banish the chill air. 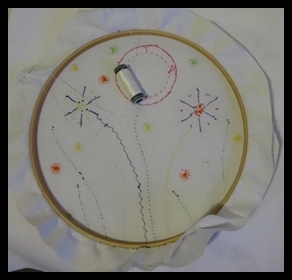 Jan has heaps of information, including an Embroidery Stitching Guide for free download, on her Windflower Embroidery website. Well worth a visit. If you want to work your own winter embroidery with Lana wool thread, visit our Aurifil Thread Australia website to find a local retailer. Read more information about Lana wool thread. For the last ten years, I have been going away for the Mother’s Day weekend to Phillip Island, a small island near Melbourne. The local “Patches” group there organise a fabulous retreat from Friday to Sunday with various tutors in attendance. The accommodation is ‘school camp’ but you put up with that as the time you have is so much fun – and you can get all your meals cooked for you (a big plus in my book!). Some attendees ‘socialise’ which means, doing more chatting and walking and shopping than the others who are in classes. I don’t mention ‘stitching’ in that sentence, as having been a ‘social’ attendee in the past, I must admit I did not do as much stitching as planned. 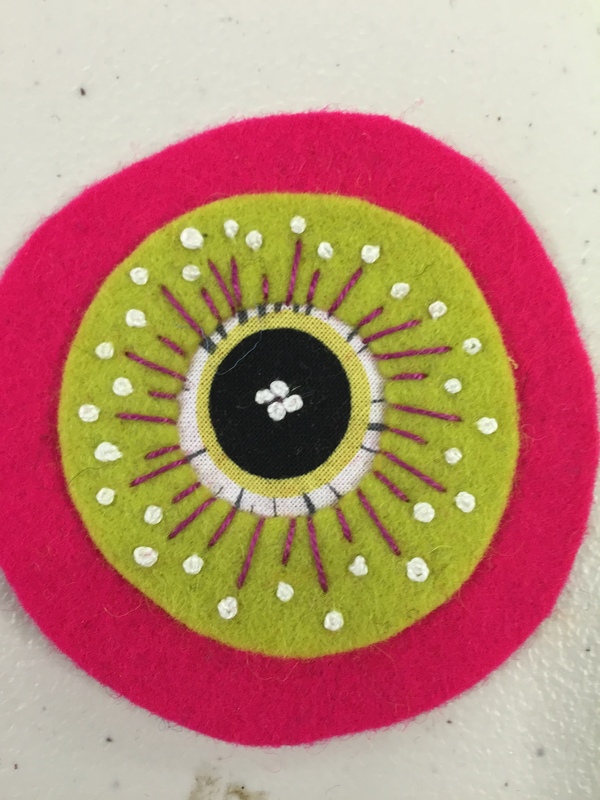 This year I had the privilege to attend a workshop with Sydneysider, Wendy Williams who showed us how to make her beautiful quilt “Birdsville” in wool felt. It was a relaxing, and (at times for me learning new embroidery stitches) a challenging time. 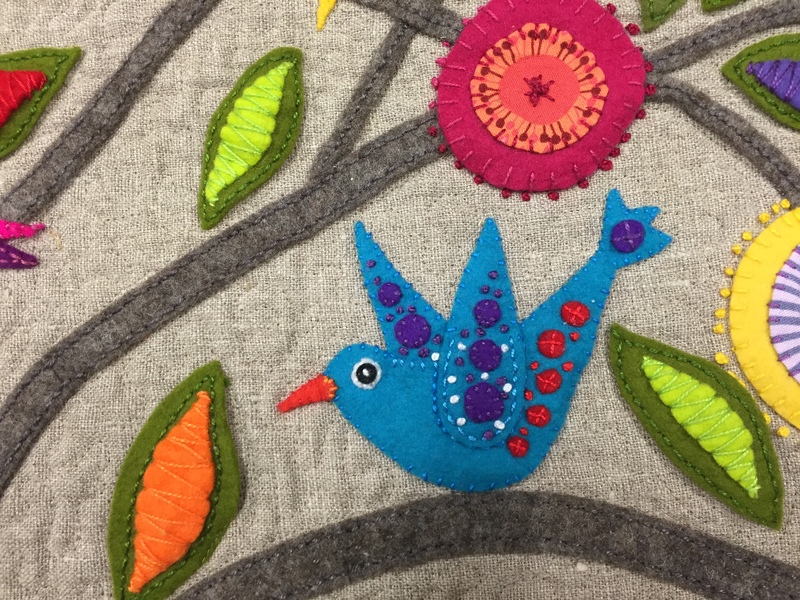 We learnt how to make the beautiful flowers, birds and leaves on the quilt as well as how to add pieced blocks and quilt it. 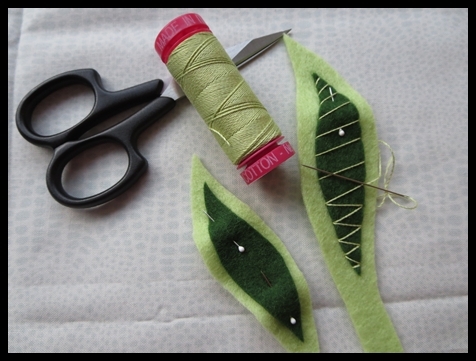 and a lonely leaf – with needle still inserted so I can remember how to do it! I managed my layout – though this has changed a little since I took this photo. 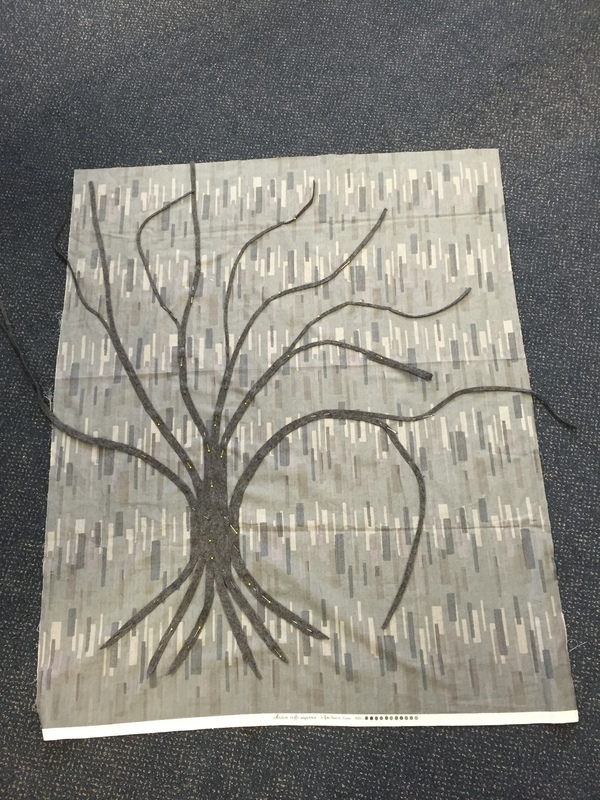 I chose a soft grey Japanese linen look to work on, with a deeper grey wool felt. 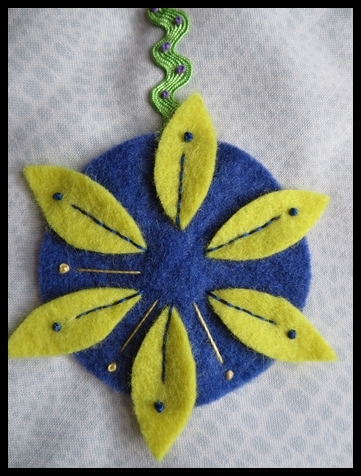 Wendy uses perle cottons for her embroidery, but I have a selection of gorgeous Ne 12 AURFIL of course, so I used those. They work so well and so easily being on a spool and with all the colours to choose from, my biggest problem is which one to use! I could use them straight from the spool or double the thread up to make a slightly heavier look to my flowers and birds. At the end of the workshop, everyone put their work down on a ‘tree’ and we saw how colourful it looked. 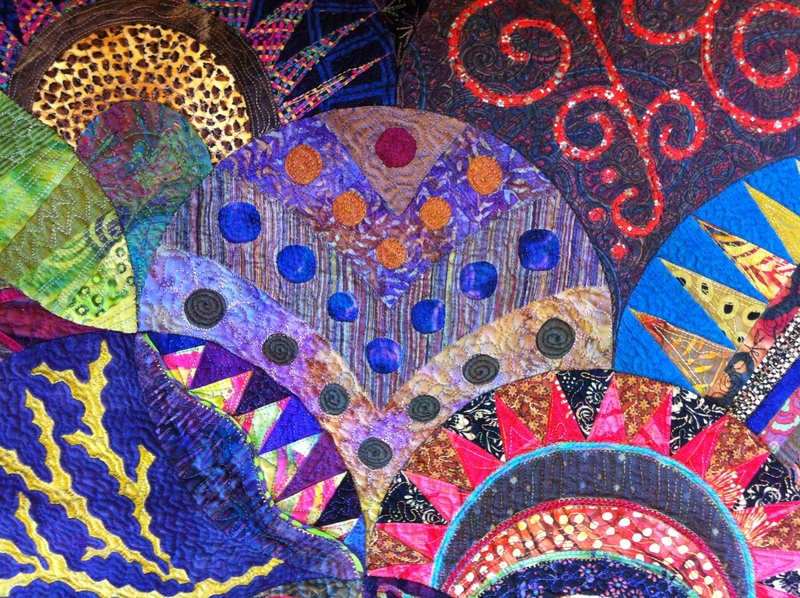 I hope I can get the quilt completed sooner than later – always the aim when you come back inspired from a great workshop. 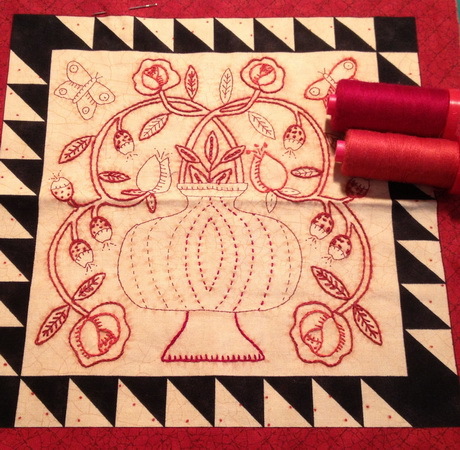 If only I could have a whole week or more just to stitch – like on retreat! Thanks Wendy for such a relaxing and enjoyable workshop. 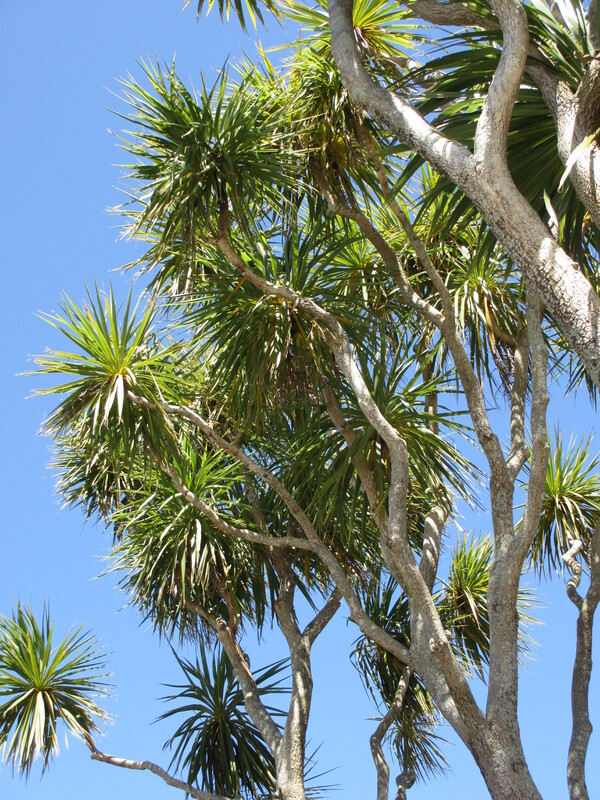 Thanks too Phillip Island Patches Committee for all your hard work to make these retreats such a delight – and I am already looking forward to next year. Maybe, I can have my “Birdsville” finished for the Show and Tell. The seasons they are a changing …. It is not officially winter but it certainly feels that way. 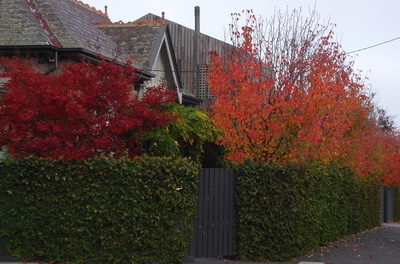 I spent much of my life living in places where there wasn’t a visible change from summer to winter, so I really enjoy the autumn colours. I am not so fond of the drop in temperature, and the rain, but if it means that I get to change my shoes from sandals to boots it can’t be that bad. But best of all I get to start a new winter stitching project! 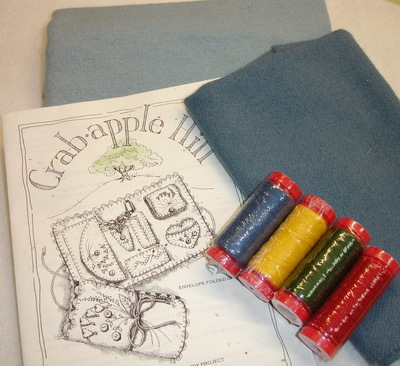 In the past I’ve worked on a variety of projects using Aurifil Lana wool thread for my winter project. Machine embroidery blocks for my Wagga. This Lana embroidery has been going for sometime but it is also close to being finished. 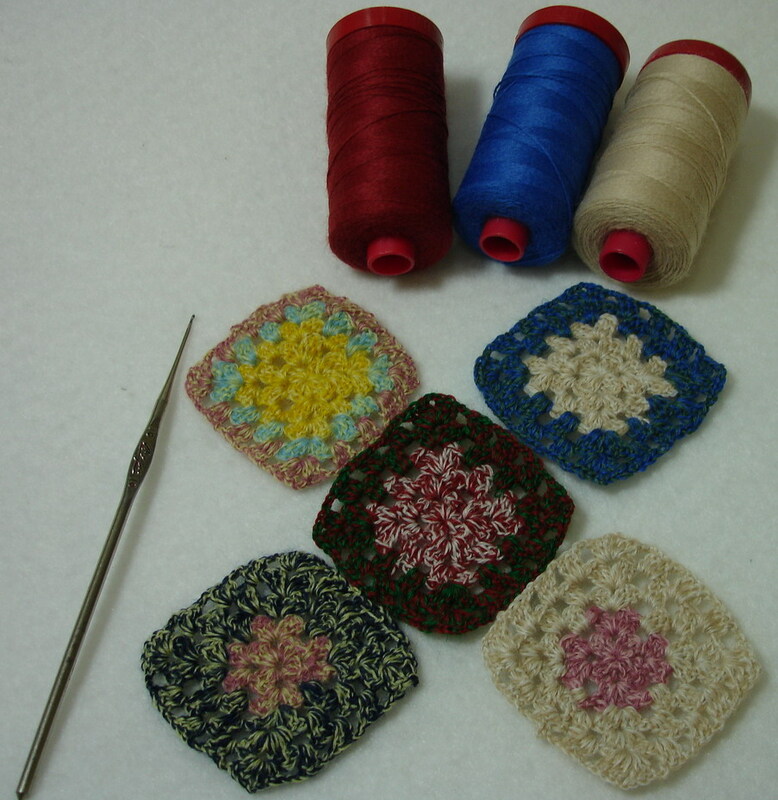 Miniature “Granny Squares” crocheted with Lana wool blend thread. And I am not the only one playing with Lana in winter, judysew4th had a great time crocheting miniature granny squares for a scarf one year. I found a pattern for this sweet little woolen envelop for carrying my sewing essentials, so I think that I have found my project for this winter. I’ve hunted out some fabric and a selection of Lana wool threads for the embroidery so I am all set up. 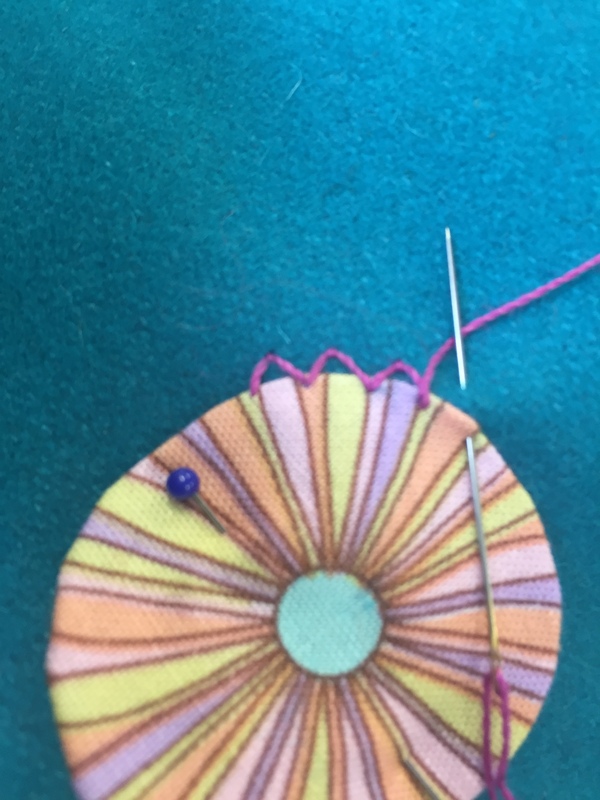 If you want to try your hand at a project using the Aurifil Lana thread checkout the full colour range on the website. 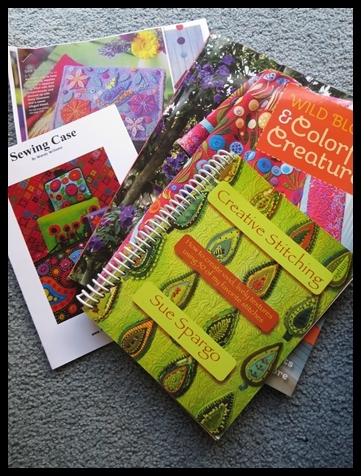 While you are browsing have a look at the patterns as well to see if there is something to tempt you to start a new project. Valentine’s Day is approaching and heart-shaped items are everywhere at present. Whether you celebrate Valentine’s Day or not, you can’t ignore the importance of the heart as a design shape and most of us would have used it at some point in our projects. My pattern printed from the internet download. Rather than the traditional red colourway used in the original embroidery, I am stitching mine in blue as this fits my decor. I am also using cotton fabric as my background in place of linen. 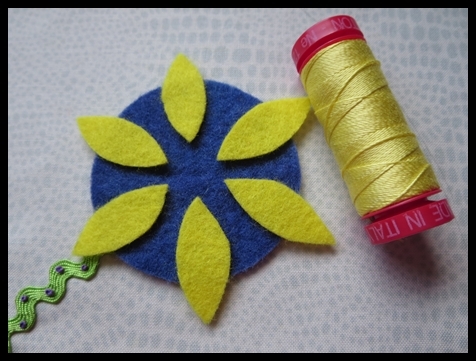 Using Aurifil 12 weight thread for embroidery. You are only limited by your imagination here. 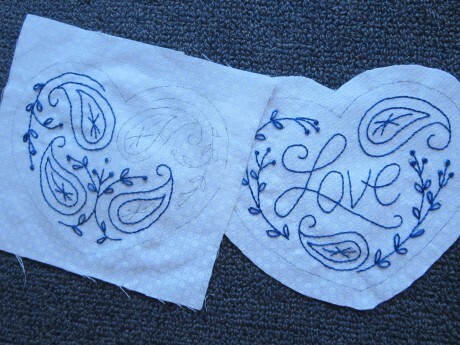 These designs would also look terrific made with wool felt using Aurifil Lana (wool/acrylic) thread. 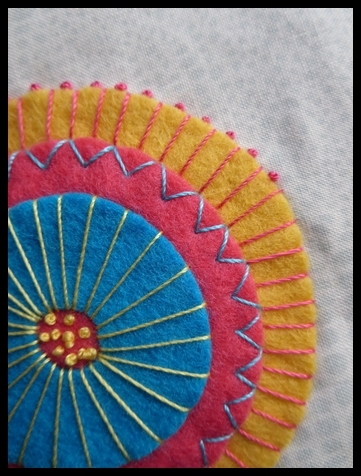 Stitching on wool felt with Lana for a different look. I tried a number of different products to transfer the design, but had trouble seeing them. 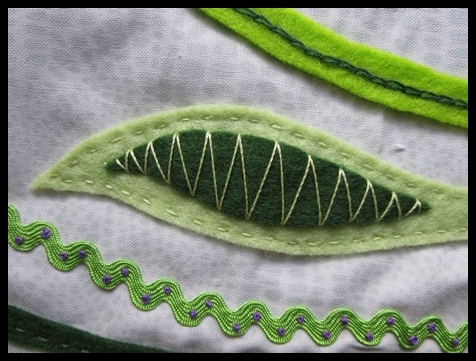 I required a mark I could clearly see, yet one which I could successfully remove at the end of the stitching. 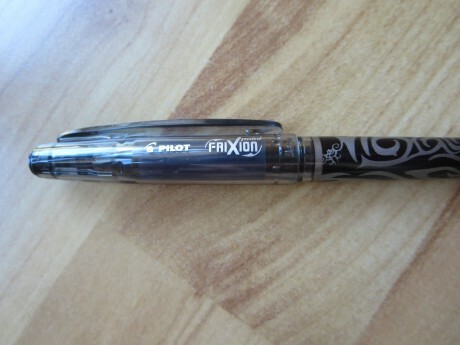 I remembered a friend telling me about the “Frixion” pens, so I gave this a go and found it worked well. This is a product by Pilot, available in a range of colours and nib sizes. Heat removes the marks, so ironing will take the marking out. If you don’t want to flatten your work with the iron, just hovering over it would probably work. I did not try using warm- hot water. Marks can apparently reappear at below freezing point (I don’t plan to be in such an environment!) , so if you accidentally remove marks before you are ready, I imagine a short while in the freezer will restore them! As with any marking item, use with discretion. This tool worked brilliantly for my purpose here, but I would probably be loath to use it on heirloom items, because I don’t know its long-term effects. Maybe a little stitching before dinner….? I’ve been away over January. 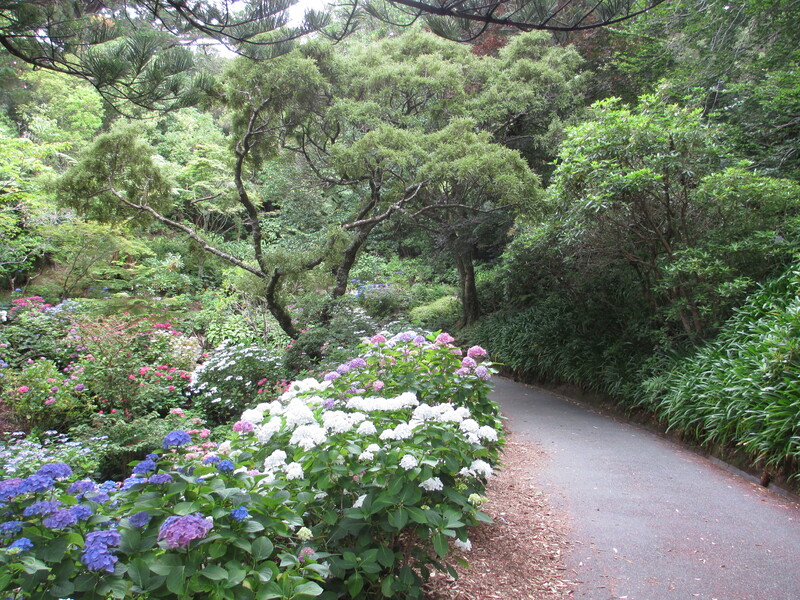 I wonder if you can guess where from the photos? 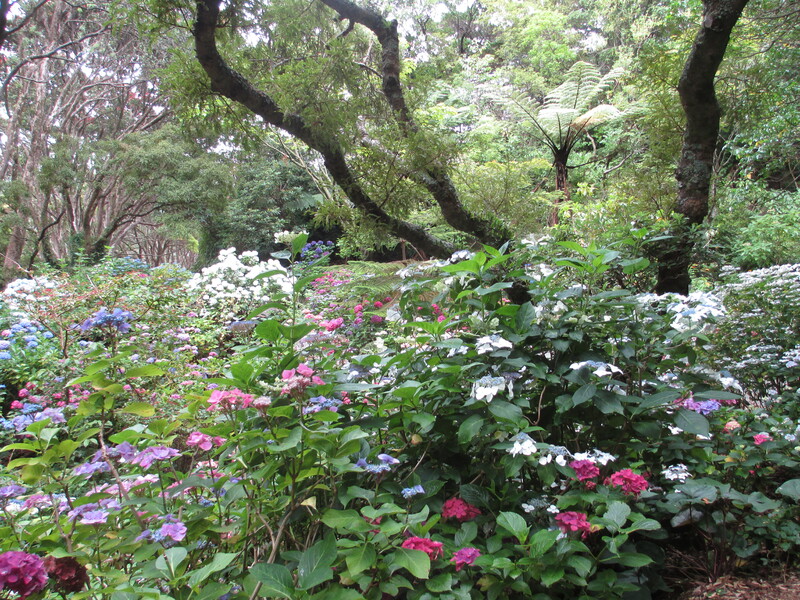 Is it an English Country Garden? I think not – given the time of the year and the season! 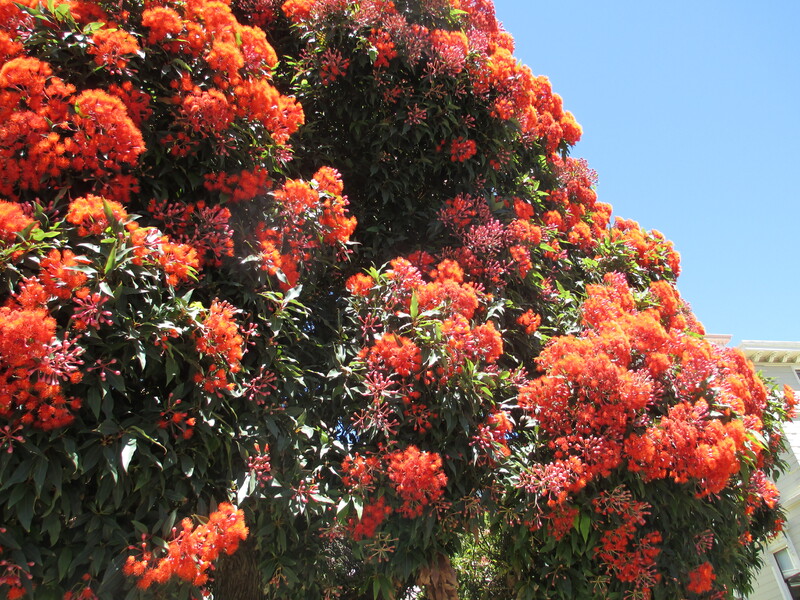 Perhaps it is another country with this magnificent gum tree in flower? Or maybe it is a tropical island? No – none of the above. 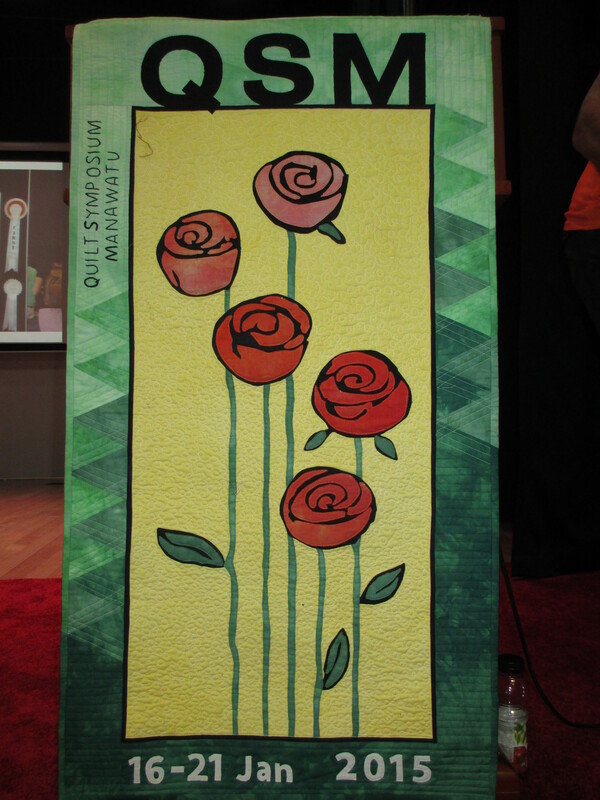 I attended the New Zealand Quilt Symposium Manawatu held in Palmerston North. 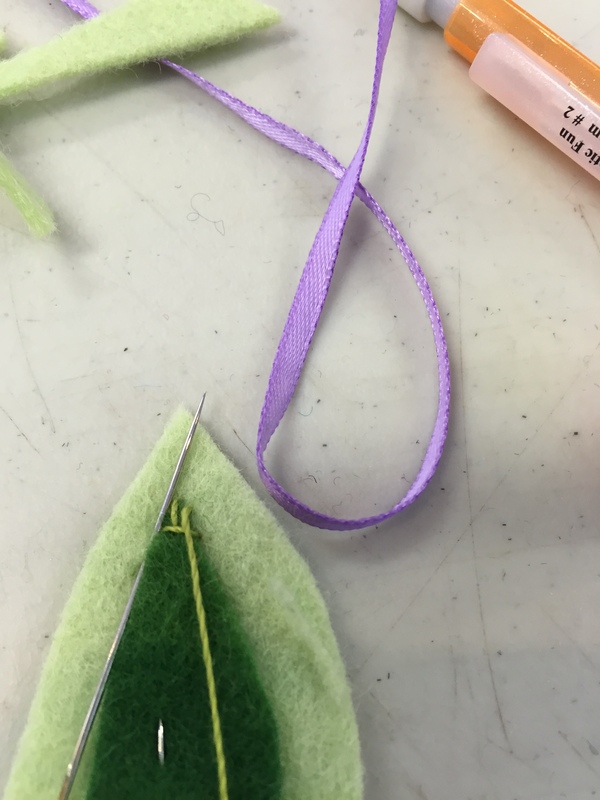 I had a wonderful time and was able to do a two day classes with Karen Stone from the USA in “Clam Session – the decorative one-patch”. Just so much fun and so many inspirational ideas to go away with. A long way to go with this quilt! 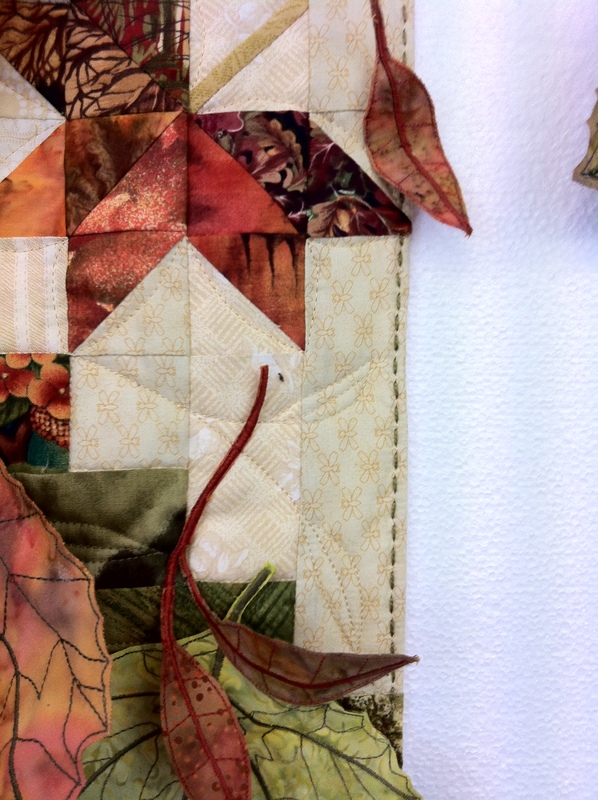 I also had a workshop for two days with Adrienne Walker of New Zealand called “Wind Fall” making an autumnal wall quilt. and my leaf being constructed under machine. It was a very steep learning curve! I loved the week I spent at the Symposium, and next month I’ll ‘bore’ you with more photos from my time away and perhaps some photos of my “works in progress”. Well done to the amazing Manawatu Symposium committee – all volunteers – who work extremely hard and so ‘professionally’ to make the symposium so successful. 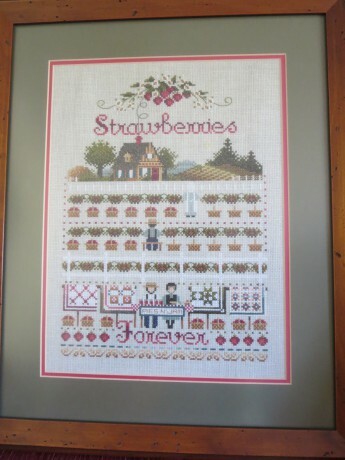 In the 1980s and early 90s, before I was bitten by the patchwork bug, I did a lot of cross-stitch. 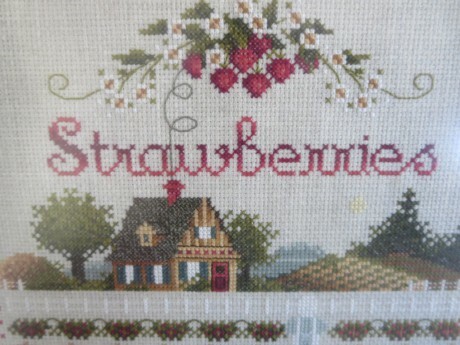 Consequently, I have many cross-stitch patterns, and yes, a number of UFOs!! Quite a high proportion of the patterns feature patchwork in some form…was this a portent of things to come? This is one of my completed projects from about 16 years ago. (The non-reflective glass makes the photo a bit hazy). Close up of Strawberries Forever. I still engage in some cross-stitch, but these days much of my stitching time is devoted to patchwork. 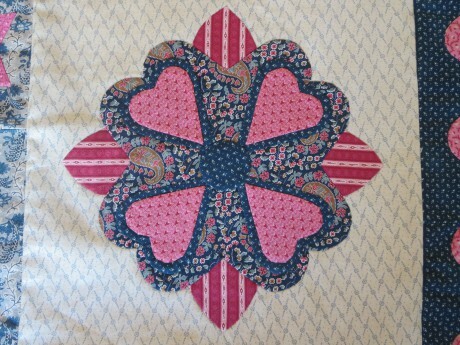 Recently however, I decided that one of the yet-to-make patterns would be ideal to hang in my new patchwork studio. 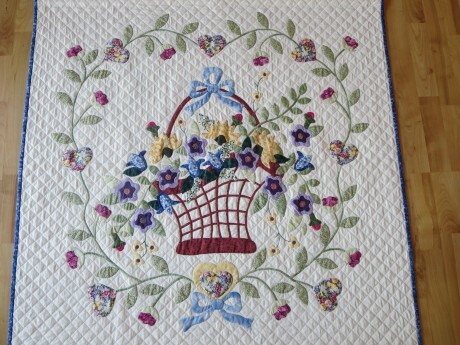 It is called “Home of a Quilter”, another pattern by Told in a Garden designs. Previously, all my cross-stitch work was done with stranded thread (before my enlightenment into the benefits and pleasures of working with Aurifil Threads). 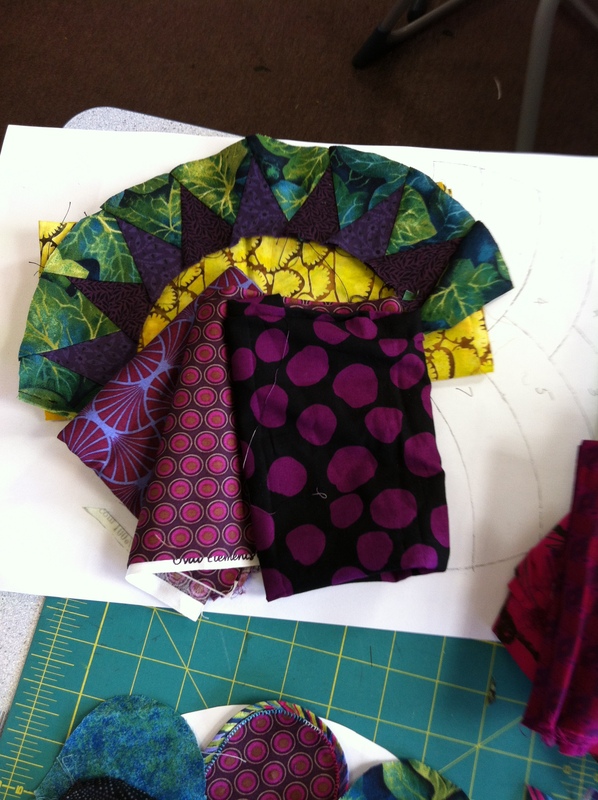 For this new project however, I was keen to use Aurifil. I am stitching on 14 count Aida and I chose to work with Cotton Mako Ne 12, the thickest of the Aurifil cottons. (That’s the one on the red spool). 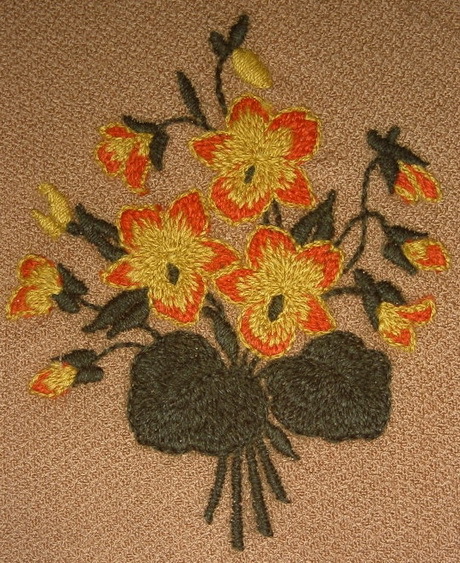 I have done many stitchery projects with this weight thread and so felt very comfortable working with it. It glides through the fabric beautifully and yippee! 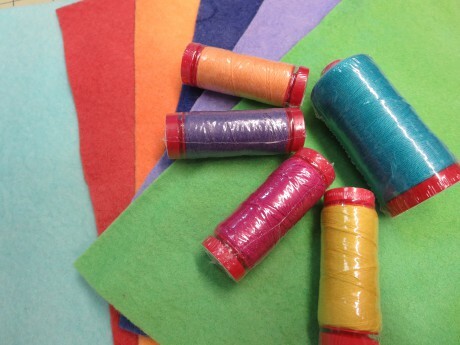 No more having to strip the individual strands of thread! Threads used in my current project. Although my pattern does not require outline stitching, I will probably use Cotton Mako Ne 28 to highlight a few of the paler colours. 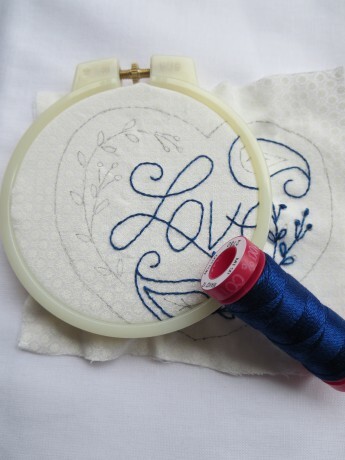 It is possible to use the finer Aurifil threads for cross-stitch too. 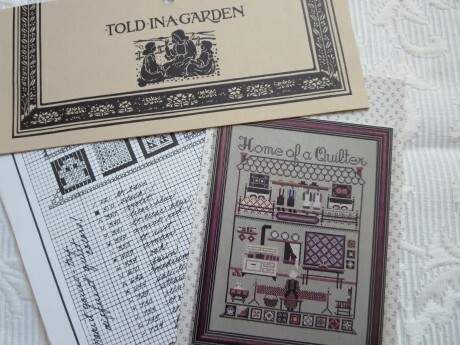 Jenny has completed two little kit projects which use Cotton Mako Ne 28 (on the grey spool). The 28 weight thread gives a very crisp look to each stitch. 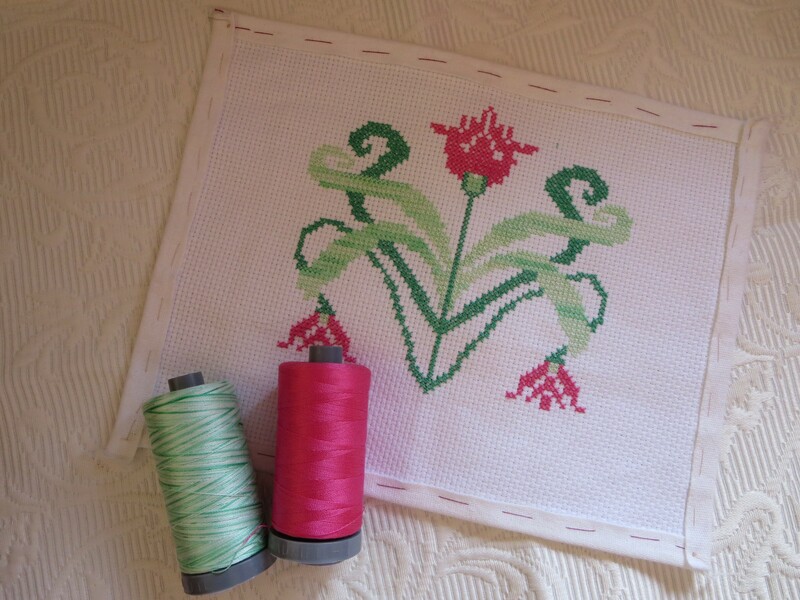 Jenny’s “Spring”cross-stitch using 28 weight thread. 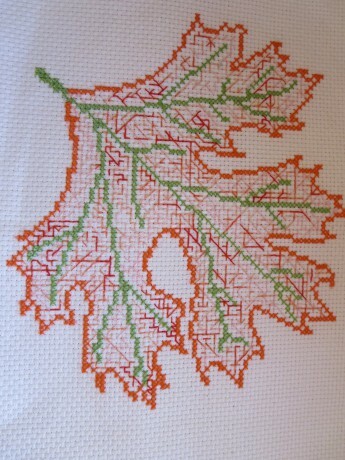 Jenny’s “Autumn” cross-stitch, also using 28 weight thread. These are from the Four Seasons Collection, and as the name implies, these are available in 4 different designs, one for each season. To view these in the Always Quilting online shop, go to http://www.alwaysquilting.com.au/index.php?act=viewCat&catId=231 These designs also utilise some of the variegated colours in the Aurifil range. 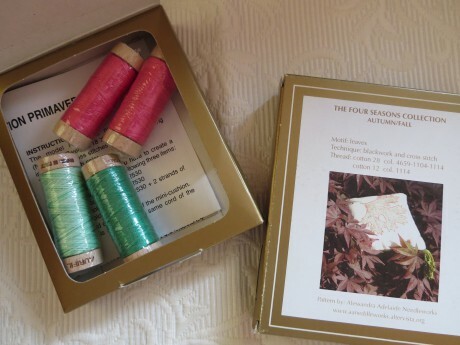 Each kit contains 4 spools of thread and the pattern and is excellent value for money. 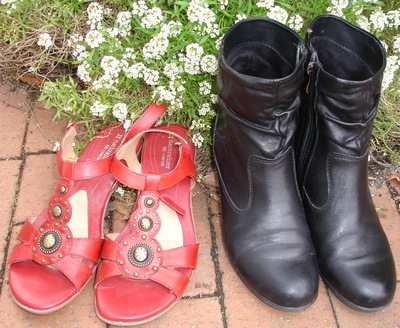 Two of the “Seasons” collections: Spring (left) and Autumn (right). 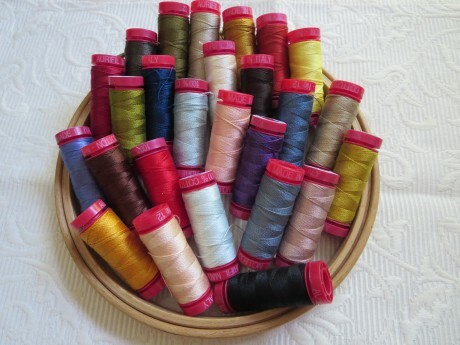 Not all stranded threads have a recommended Aurifil conversion colour, but with 270 colours in the current Aurifil range, there is sure to be something suitable. 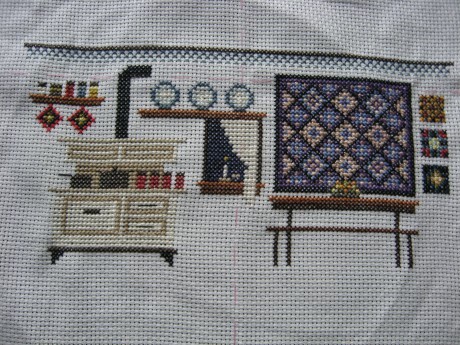 I have been working on my current cross-stitch for just over 3 weeks and am about a quarter of the way through it. This is the portion I have completed so far. Partially completed “Home of a Quilter”. Hopefully I will have the stitching finished soon, so that this will be ready to hang in the new year…I’ll keep you posted!